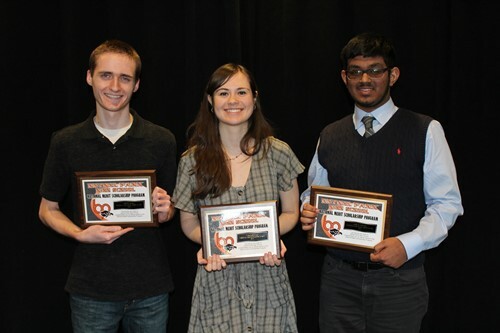 Bethel Park High School hosted its annual National Merit Scholarship Recognition Luncheon to honor our three Commended Students--seniors Joseph Bilski, Julia Herrman and Jerry Varghese. They were recognized for being among the top 50,000 scorers on the PSAT Exam nation-wide, which they took last year as juniors to become eligible for the National Merit Scholarship Program. Over 1.6 million high school juniors took the PSAT in 2017, so Joseph, Julia and Jerry are among an elite group of students in this nationally-recognized program. Attending the luncheon were the students, their parents, Bethel Park High School and Central Office Administrators, and BPHS Counselors. Speaking at the luncheon were BPHS Principal Dr. Zeb Jansante and BPHS Superintendent Dr. Joseph W. Pasquerilla. The BPHS Orchestra Ensemble performed. BPHS Associate Principal Joe Villani presented the students with a plaque, and the students spoke about their experiences at Bethel Park High School, sharing how BPHS has prepared them for their futures. They also shared their future plans. Joe will be attending the University of Pittsburgh and majoring in Chemical Engineering. Julia has her college choices narrowed down to three and will major on Psychology. Jerry is undecided about his college choice, but he will definitely be majoring in Aerospace Engineering. Congratulations to these three outstanding students. Please click here to see some photos from the event.